Download our data sheet to learn how you can achieve compliance to ISBT 128 standards and streamline label printing and scanning. 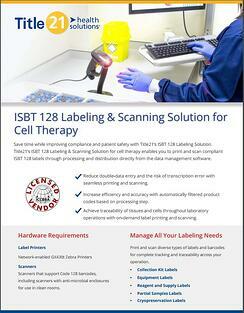 Title21's ISBT 128 Labeling & Scanning Solution for cell therapy enables compliant ISBT 128 labels to be printed and scanned throughout collections, processing and distribution workflows from Title21's end-to-end data management software for cell therapy. Download the data sheet today to learn more!